The role of the parent in a child’s sporting career is equally as important as the coaches, however it is distinctly different. The coach may see the child for a couple of hours a week, the parent doesn’t have that option. After a tough loss or embarrassing moment the coach can spend a minute or two talking it through with the child, the parent is the one who gives the child the confidence and opportunity to return. Most parents want their child to be successful in their sporting career, however the definition of success may differ between individuals, and the child may have different aims to their parents. Children don’t play because they want a nice car, but some parents see a sporting career as being a potentially lucrative option. The FA surveyed thousands of young footballers on their reasons for playing, and the top results were to have fun and to see friends. As such any support that parents offer should be done to help the child achieve their own self directed goals. Cutrona and Russell (1990) theorised that there were four different types of support, emotional, esteem, information, and tangible or practical support. Emotional support aims to provide comfort and security to the recipient, which is the bedrock of parenting. That security gives children the confidence to try new things, safe in the knowledge that the punishments for failure are minimal, which translates beautifully to sports. Esteem support concerns the child’s perceptions of their own competence. If a child’s esteem isn’t supported, they can feel like failures and lose motivation to continue. If you’ve ever met an individual who believes they ‘aren’t the sporty type’, you’ve seen what a lack of esteem support can result in. Everyone can be the sporty type, given enough support. Informational support is the technical and tactical guidance that a parent gives their child. This can be done at a park or in the garden, though if it conflicts with the coach’s instruction it can lead to confusion. Speaking from my experiences in football, everyone has an opinion on the ‘right’ way to play, but outside of football most of the information we give children is not opinion based but fact based, so it can be confusing for them to hear there are multiple conflicting ‘right’ answers. This is an opportunity for children to develop their own ideas of the ‘right’ way to play, the style they most enjoy watching or playing, and helping them discover more about it. Tangible support takes time, money, and effort. It’s a fancy term for paying for and ferrying the kids to sessions, for the most part. It can also include volunteering to help with the needs of the team, for example by acting as linesman or lineswoman on matchday. It might mean washing kits, especially if the children like a chest slide goal celebration! Without it, children have very few opportunities to compete. 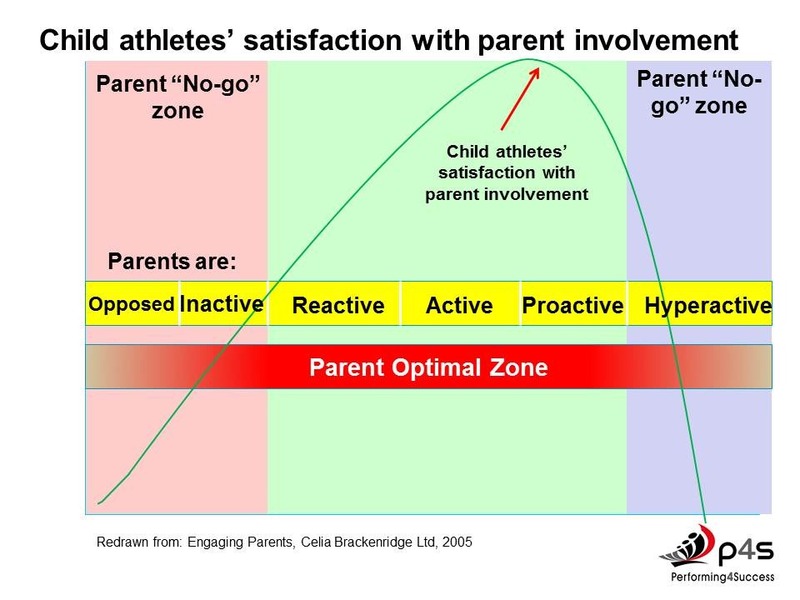 The Parent’s Optimal Zone theory (Brackenridge, 2005) states parental involvement levels range from opposition and total disengagement, to hyper-active and controlling, with the optimal level being between the two extremes. Opposition may come in the form of a parent feeling that a sport is inappropriate for or unworthy of their child, for example holding the opinion that girls shouldn’t play rugby. A controlling parent minimises their child’s autonomy, which is a huge part of their enjoyment of sports. The optimal zone is defined by a few key traits. Firstly by a willingness to listen to the child about their thoughts and feelings around sports. That being said, children may need some guidance to reach useful conclusions, for example about their reasons for participating or their feelings of self-competence. Recently I worked with a player who was considering dropping out as a result of his rock bottom feelings of self-competence. His focus was entirely on the mistakes he’d made in matches. I reminded him that these matches weren’t for money or trophies, they were opportunities to try things and succeed. I reminded him that no player has ever gone through a game without making a mistake, reframing his expectations of a match. He looked at matches in a new light, and regained his motivation to play. Another trait of optimally supportive parents is emotional control. Adults influence the mood at sporting events to a huge degree, and children will often reflect the messages coming from the sideline. For example if the parents are verbally challenging or abusing the referee the children will often begin to do the same. Another negative aspect to this is that if children are focusing on the referee they’re not focusing on their own play, which is the reason they participate. They can also begin to make excuses, believing that the game is unwinnable and therefore losing motivation and giving up. Optimally supportive parents also maintain a long-term view. It can be easy for players to focus on a single result or even a single event within a game, and lose sight of the big picture. Players need reminding of their own improvements over the course of their career, as they can often feel as though they aren’t improving alongside their peers who improve at a similar rate. Some parents do focus on results, and this can lead to a distorted perception of the player’s competence. At grassroots level, teams will often have players missing, or be affected by mundanities like missing breakfast. Elite footballers never shut up about ‘just getting the three points’, but they play for entirely different reasons than children. If the first question a parent asks of their child after a session is “Did you win?”, that child learns that winning is the primary aim of that session. Did you use that skill you’ve been practising? Did you feel brave when you played? Did you communicate with your teammates? Research has shown that focusing on personal progression increases not only enjoyment, but also motivation (Duda and White, 1993), which should improve performance over the long term. Next Reflective practice for coaches. Are you asking the right questions?